Here is one of the finest prestige properties Brisbane has to offer - a 3923m2 river front property set in the midst of sought after Highgate Hill. Only 5km to the CBD, this grand manor is one worth viewing. The manor itself is situated on 2 lots and a 3rd lot is natural rainforest. A family room with its glass paneling brings you a full view of a rainforest setting where one would imagine you were living in the tropics yet you are so close to the city. 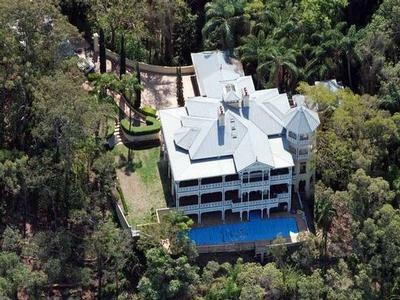 The 3 storey Victorian mansion with its absolute water front living and size of land is priceless. With lifestyle and convenience in mind, this opulent home features a sky lit entry which leads to a separate formal lounge and dining with its own fireplace. The family room, also with its own fireplace, leads to a grand circular granite kitchen with quality appliances. This luxurious mansion not only features 7 bedrooms, 6 toilets, 4 bathrooms and a 3 car lock up garage. Most of the bedrooms and living areas are embraced by the 12 foot verandas that drape around the outside of the residence, giving maximum views of the river. The master suite with its large marble ensuite provides a haven from your every day routine. Sit back and relax, in the large spa overlooking the river and rainforest background. Designed to entertain, the lower level doubles as a retreat away from the main living areas encompassing the 2000 bottle wine cellar with a kitchenette and theatre room that opens to the heated pool. Two large bedrooms with a common bathroom caters for your guest. A heated 23m pool, private pontoon, electric boat lift suitable for a 30ft vessel and even a separate self contained guest bungalow are the many features you would expect from such a prestige riverfront property.